This was yesterdays outfit! A grey maxi with a slit from XXI, a skull scarf from eBay, hidden Steve Maddens, and a belt from H&M. I like maxi dresses a lot but at the same time I dislike them. It seems that whenever I wear them I always want to change out of them in a short amount of time. I guess the length of the dress can overwhelm me. I don't think they are the best option for summer dresses, but I do like them overall. 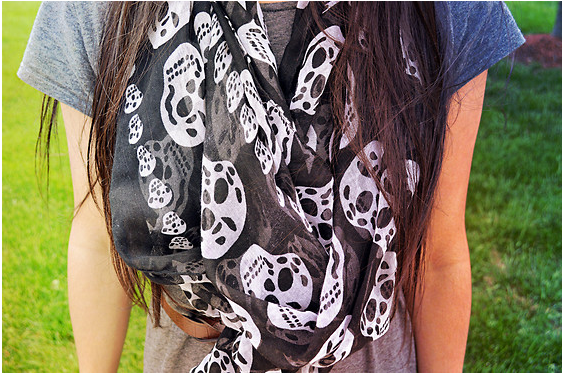 I have fallen back into my skull obsession leaving me buying all sorts of skull worthy accessories. Haven't quite decided if that's a good or bad thing yet. Today I went shopping with a friend of mine, and I am heading out to work pretty soon. Have a fabulous Thursday!